Is the best camera the one you have on you? There seems to be two main schools of thought when it comes to camera technology and photography. One suggests that it's all down to the photographer holding the kit, while the other suggests that the more money you plough into your system the better your results will be. In actuality, of course, it's probably a mixture of the two. It's pretty fair to say that even the best photographer in the world will be met by limitations when using a compact camera. But, there are occasions when a compact is the only realistic option. Press photographers are increasingly coming to rely upon compact cameras, and in some extreme cases, mobile phones, to get pictures. Speaking during a seminar at the recent Canon Pro Solutions show in Islington, Peter McDiarmid, a senior news photographer for Getty, and Neil Turner, from the British Press Photographers Association talked about shooting the recent London riots using nothing more than a Canon G11, a high-end compact camera. The G11 used to sit right at the very top of Canon's compact line-up until it was replaced by the G12 last year, and actually costs more than some of its very low-end DSLRs, so it's not to say that Peter was shooting with a budget snapper. However, considering that Peter would normally head out tooled up with at least three professional DSLR bodies, an array of lenses and a backpack full of other accessories, shooting with just the compact is seriously pared down. Both McDiarmid and Turner pointed out that they always carry a compact camera with them "just in case", with McDiarmid also using the smaller Canon PowerShot S95. During the recent riots, we heard many stories about photographers on the scene not being allowed near the action by the police, or worse, having their personal safety (and expensive gear) threatened by rioters. So, says, McDiarmid, shooting with a compact gave him "amazing freedom." He wasn't discreet about shooting, instead trying his level best to look like an non-threatening amateur, holding the camera out straight in front of him, using the screen to compose images. The G11 uses a 10 million pixel sensor. For newspaper images, which print at an equivalent of 150dpi, an image with a resolution of 1.48 megapixels will suffice for a 6x4 inch print, while even a full page only requires an image of 3.6 megapixels. This meant that McDiarmid was able to shoot freely, knowing that his images could be cropped later if necessary. McDiarmid said that the biggest problems he faced when using the compact was low light shooting and the inability to track a moving subject, such as he would be able to do with his usual camera. However, he was able to get into a position that none of his press colleagues could manage, and ended up with cover shots on The Mirror, the Independent, The Metro and the Telegraph. One of his pictures was also used as a double page spread in Time Magazine. 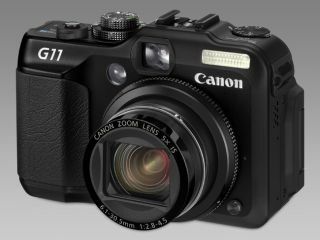 The G11's 1/1.7 inch CCD sensor is significantly smaller than a DSLR, so is likely to bring about noise issues with it. However, even professional landscape photographers, such as Joe Cornish, has referenced creating saleable prints with the camera. While there are obvious limitations to working with a compact camera, there are certain technological advantages that can help in a few situations. As light levels were falling, McDiarmid needed to keep the aperture as wide as possible to reduce noise levels. The G11 can reach a maximum aperture of f/2.8. One of the most iconic images of the riots, the very image that graced the front pages of the aforementioned newspapers, features a burning van in the background, with a person walking in front of the van. McDiarmid pre-focused on the van and waited for someone to walk into shot for the perfect composition. Shooting at f/2.8 on a camera with a small sensor will give you a far wider depth of field than shooting on a full-frame camera. If this picture had been photographed with a DSLR, it's likely that the person would have been so out of focus as to render the picture unusable. It almost goes without saying that in these days of 24/7 rolling headlines, it's likely that we'll see more and more press photographers turning to compact cameras to get their images in difficult situations, so it will be interesting to see how camera manufacturers respond to increasing demands. Let us know what you think in the comments box below, via our Twitter feed or on our Facebook page.